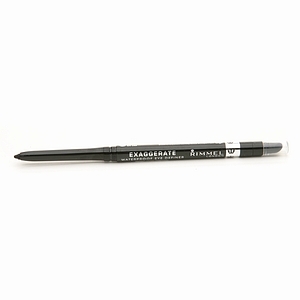 Cheap Thrill of the Day: Rimmel London Exaggerate Waterproof Eye Definer | Fashion. Style. Beauty. | Life is short. Live well. I love eyeliner for quick eye definition but for those of us with particularly flat eyelid surfaces, eyeliner can start to run and go from rocker glam to heroin chic pretty quickly. This is when waterproof eyeliner comes in handy because the last thing you want (theoretically) is eyeliner dripping down your face a la Alice Cooper. I recently grabbed this slice of awesome waterproof eye definer from Rimmel and I use it all the time now. Apply, smudge, give it about a minute to set and then move on with the rest of your look. It stays put until you’re ready to take it off. Genius. I mean, now, if you’re trying to bring the whole heroin chic thing back, good luck with that. But even Kristen McMenamy and 90’s era supermodels have moved on. Maybe consider letting that go.